The Mario Kart series is known for simple fun that everyone can take part in. Even people who never play video games are willing to pick up a controller to race their friends in. I have personally seen this myself with some members of my family. Family who would otherwise never touch a controller, hear the words “Mario Kart” and they ask, “Can I play?” It’s hard to do that with a video game, but Mario Kart does. I’ll bet 95% of people reading this review have either already gotten Mario Kart 8, or are planning to get it soon. I ask myself, is this review really necessary? Yes, because I have to convince the other 5% to get this amazing game. Seasoned Mario Kart players know what to expect from the single player mode. Grand prix, time trials, versus, and battle modes are all available once again. Grand Prix and time trials are most likely the only modes most people will play single player, considering versus and battle are available locally and online; I’ll discuss those in a minute. Grand Prix comes in the standard 50cc, 100cc, and 150cc modes, each one faster and harder than the previous mode. Of course the mirror mode also makes an appearance, which mirrors the course. You unlock this mode by getting gold in every 50cc, 100cc, and 150cc grand prix. It has been said that mirror mode is at 150cc difficulty, but mirror mode has always been harder for me than 150cc. I have not personally tried time trial mode myself, as I never found it too exciting. However to make it more exciting, Nintendo has “staff ghosts” you can race against. It is exactly what it sounds like; you race a recording of a Nintendo staff member, known as a ghost. There’s definitely a feeling of accomplishment of beating actual Nintendo staff members at their own game. Versus mode is simple, one person chooses the options such as the cc number, karts/bikes only, item selection, and many others. Online racing against anyone you can’t select the options, but racing against friends you can. The local versus is where you will have the most fun. Mario Kart is a series that proves local multiplayer can be much more fun than online. Be warned, as Mario Kart will turn even the tamest person into a competitive maniac. There’s a reason some people say “Mario Kart ruins friendships.” Because you’ll probably want to strangle your friend who just robbed you of first place with a blue shell. However in the end it’s all in good fun. If you don’t have friends around 24/7 to play local multiplayer, you have the online racing option. You can choose from worldwide, regional (your country typically) friends, and tournaments. It has never been easier to find people to race against, literally all you do is select worldwide or regional and you’ll jump into a group that you’ll start the next race with. Before each race you can vote for a choice of three tracks or a random track. After everyone casts his or her vote a course is selected roulette style. Each player has a rating I call “street cred” if you do well in a race your street cred goes up, and if you do horrible your street cred goes down. Overall, the online in Mario Kart 8 is fantastic. Battles, well, are a little disappointing. There are no dedicated battle stages, just regular tracks. Battle arenas in most games are usually pretty open, not locked into a set path like a track. This makes battles less exciting; it feels more like you’re driving in circles than in an actual battle. If you miss your chance to hit an enemy with an item, you won’t be able to reach them unless you continue driving in that path. Turning around and catching up to them is just about impossible. It feels far too linear and gets boring fast. The kart selection is very similar to Mario Kart 7, which is a good thing. You can choose between the body of the car/bike, the wheel type, and the glider. The body and wheels change the most about your racing vehicle, as the gliders barely make a difference. Vehicle customization gives you many options, but what adds even more options is the racer you choose. 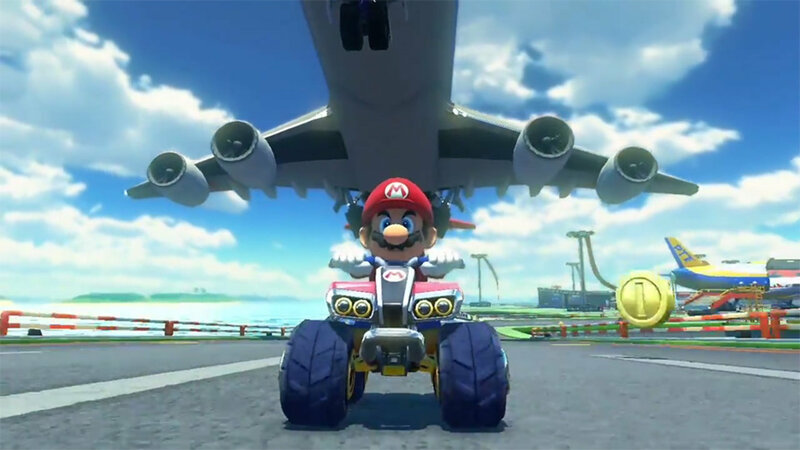 The character you use in races also has an effect on your kart or bike; think of characters as a fourth vehicle customization option. The major change in Mario Kart 8 is the new feature to drive on walls, ceilings and everything in-between. This compliments the new tracks extremely well. This is something that I don’t think anyone saw coming; it’s incredibly creative, and just another reason I love Nintendo. I was nervous that this twisting and turning of tracks would cause some gamers to get nauseous or dizzy, but Nintendo did a phenomenal job of preventing that. The camera angle is controlled perfectly; I have never gotten even mildly dizzy, and I haven’t heard of anyone else getting dizzy or nauseous. One small feature that was added in Mario Kart 8 is the ability to watch highlight reels; showing off your best moments in the race you just finished. You can use the rewind, fast-forward, and slow-motion tools while watching the highlight reel. This brought us the Internet famous “Luigi death stare” video that has gone viral. Graphically, Mario Kart 8 is one of the best looking games on Wii U, if not the best looking game. Everything looks flawless, and the music is just as flawless as the graphics. I could talk about how great the tracks are, but that would quadruple the length of this review. All you have to do is play the new rainbow road stage to see how great this game plays, looks, and sounds like. The next time I hear someone complain on how weak the Wii U is, I’ll direct that person to Mario Kart 8. Mario Kart 8 is an incredible game that everyone must play, and it has proven that with the amazing increase in Wii U sales. It’s hard to find fault with such an amazing game, the only downside I’ve mentioned is that battle mode has bad stages. This isn’t important though, because battle mode is the side dish in an otherwise delicious meal. Be sure that you don’t miss out on this awesome racing experience. Impressive review! Thank you for all of the articles and features you have posted lately I really appreciate it. No problem, Rukiafan! I really enjoy writing these reviews and features! Mario Kart 8 is one of the best games in the series, but I agree that the battle mode has been nerfed. Great review, my friend! You seem to have a real passion for writing reviews. I hope it leads to bigger and better things for you. Thanks for the praise you guys! Also @NINTENBRO82 I really love writing. It's fun for me, especially when I can write about video games. I'm actually writing a book series right now that I want to self-publish on the kindle eBook store. It's not on video games, but rather science-fiction. I hope to purchase this within the next month. It is a great game! Nice review. This game is awesome, but I hope a real battle mode will be added in future dlc. Good review! Will this be revised once the dlc releases? @ToughGamer I think I might write a mini-review on the Mario Kart 8 DLC once it comes out. That would be better than revising an old review because nothing of the core game changed, but adding a mini-review on the DLC would be nice to have for the site. Great review! This is one of the best Wii U games that has been released!